The Cadets have had an impressive start to their competition season and are getting ready to “march” on with another weekend of activities! 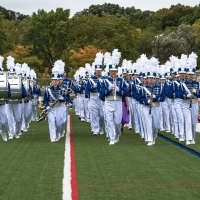 Parents should check their email for information about Friday’s homecoming game performance and details about Sunday’s activities leading up to the Cadets’ performance at Nathan Hale Stadium. For details about the competition including ticket prices, performance times and a layout of the stadium, please click here: Wisconsin Lutheran High School Marching Band Invitational. For directions to Nathan Hale Stadium, click here. We’re looking forward to another great performance and hope to see a big crowd of Cadets fans this Sunday!